From Oscar® winning director Steven Spielberg (1998, Saving Private Ryan; 1993, Schindler’s List) and Oscar® winning producer Peter Jackson (2003, The Lord of the Rings), comes the 3D animated epic THE ADVENTURES OF TINTIN: THE SECRET OF THE UNICORN, available on Blu-ray 3D, Blu-ray Triple Play (Blu-ray, DVD and Digital Copy) and DVD 19 March, 2012 from Paramount Home Entertainment. 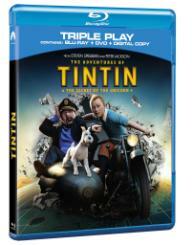 Visionary filmmakers Spielberg and Jackson combine their remarkable talents to bring Hergé’s classic comic book characters to stunning new life in this globe-hopping quest that spans hidden mysteries, menacing criminals and an ancient treasure. Featuring the vocal talents of Jamie Bell (Billy Elliot), Andy Serkis (Rise of the Planet of the Apes), Daniel Craig (The Girl With the Dragon Tattoo), Simon Pegg (Mission Impossible: Ghost Protocol) and Nick Frost (Attack the Block), THE ADVENTURES OF TINTIN: THE SECRET OF THE UNICORN has dazzled audiences around the world with its treasured mix of action, humor and suspense. Now, this international smash hit and 2012 Golden Globe winner for Best Animated Feature soars to thrilling new heights on Blu-ray 3D, Blu-ray Triple Play and DVD, featuring sparkling picture and sound, plus hours of bonus features spotlighting the making of this new animated classic. Based on the internationally beloved and irrepressible characters created by Hergé, the story follows the unquenchably curious young reporter Tintin (Bell) and his fiercely loyal dog Snowy as they discover a model ship carrying an explosive secret. Drawn into a centuries-old mystery, Tintin finds himself in the sightlines of Ivan Ivanovitch Sakharine (Craig), a diabolical villain who believes Tintin has stolen a priceless treasure tied to dastardly pirate named Red Rackham. But with the help of his dog Snowy, the salty, cantankerous Captain Haddock (Serkis) and the bumbling detectives Thompson & Thomson (Pegg and Frost), Tintin will travel half the world, outwitting and outrunning his enemies in a breathless chase to find the final resting place of The Unicorn, a shipwreck that may hold the key to vast fortune . . . and an ancient curse. 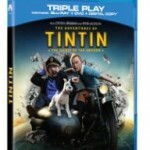 THE ADVENTURES OF TINTIN: THE SECRET OF THE UNICORN, with screenplay by Steven Moffat, Edgar Wright and Joe Cornish, is based on “The Adventures of Tintin” by Hergé. It was produced by Steven Spielberg, Peter Jackson and Kathleen Kennedy, with Ken Kamins, Herge Estate’s Nick Rodwell and Stephane Sperry as executive producers. The co-producers are Carolynne Cunningham and Jason McGatlin. Spielberg is joined by his Oscar®-winning collaborators, editor Michael Kahn (1998, Best Film Editing, Saving Private Ryan), A.C.E. and legendary composer John Williams (1993, Best Music, Original Score, Schindler’s List).